Link up with LINQ and see how you can query almost anything! So you′re the inquisitive type? LINQ answers your biggest query "Why can′t I develop database and XML queries in a language I already know?" This book introduces you to LINQ and the .NET Framework technologies, so you can use LINQ to query any object, any dataset, any kind of XML, SQL Server, and more no questions asked. The dummies book series has been one of my favorite "clear away the confusion" book series. Admittedly Linq is a troublesome subject, but I have to say this book is a fair introduction to the subject area. Linq is one of the important emerging areas of abstraction in the .NET languages along with Parallel programming, ADO.NET 4, and WCF. Most books on Linq leave you still confused and uncertain after reading them. Here the opposite is true, you are left with the feeling of understanding the subject and that the clouds of confusion are clearing away. Abstraction allows computer language to better match the way we think which is in concepts. Linq allows us to conceptualize the extraction and insertion process with common language operations that have to do with communications. Linq has four basic parts, to objects, to XML, to SQL Server, and to Entity Framework. Entity Framwork linqs are not covered in this book. When I first started looking into Linq last year I was specifically concerned with Linq to SQL Server because I thought that this was the real strength of the Linq language extension. However, I came to realize that there were far more incidents that benefit from Linq to objects than anything else. I have studied Linq to Entities hoping that other databases could be brought into the common usage area that .NET is developing and ran into an enourmous ammount of study and planning to make it work. So, I have learned to focus on Linq with objects as the most practical useage for Linq. This book not only does a fine job of introducing Linq, but goes on to show how it can work with Microsoft Office, COM objects, Active Directory, and Datasets. There is a wide diversity of operations that should serve the reader well no matter what areas of language development interest him. Unusually good for a book of this order are the last two sections which focus on the best use of planning and strategy to make Linq as useful as possible. Take a step back and abstract the entire process of Linq and your programs will take a step or two upward in quality and manageability. I am giving this book five stars for a beautiful and comprehensive introduction to Linq. No matter that I have three other books that give deeper and more thourough development of this subject, I still return to this book for inspiration. 2.0 out of 5 starsYou're a dummy if you think you're going to learn anything. Boy am I a dummy for buying this... The main problem -- and it's a serious one -- is that the author should show the input data sets and the resulting data sets for any LINQ queries. It's not complicated. We need to see what various query components actually do. It's hard when you have to guess. Now maybe you're supposed to download some code from somewhere and run it in the debugger, I don't know. If I have to do that then why buy a book? Like most of the books in the Dummies series, this one has a light-hearded tone. It makes the topic of LINQ pretty clear. I was dead-new to the material, so the fact that I could follow and understand the examples means it is doing its job. The intriguing part about the Dummy series published by Wiley is that these books cover general basics about any given subject matter. They present the material straight forward in an easy to read manner. Typically, if a reader has time, one such devoted individual may accomplish this feat during a weekend sitting as the common length of a Dummy text usually delivers between 250 to 400 pages. The writing style contributes to this quick pace by offering humor and joviality to the mix. Rich Tennant's comic illustrations, a greatly appreciated staple in the Dummy series, bring a common sense angle of the problem at hand into perspective which often elicits a chuckle. Nonetheless, the expectation is to immediately grasp the concept and build a knowledgeable foundation from which to work from. From this point, the publishers at Wiley wisely require the Part of Tens section in each of their Dummy books in which one can jump into more advanced topics to continue the educational process. Overall, the authors, themselves, should be commended for their efforts to transform technical goo into some comprehensive pastry for the mind without the gratuitous fluff that other bigger tomes exploit, ultimately, bumping shipping costs higher. 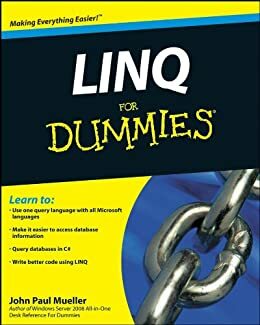 By now everyone expects these conventions from any "(Insert Subject) for Dummies" book, and "LINQ for Dummies" written by John Paul Mueller is no exception. Release of this book coincides right around the time LINQ started to surface, so the author has firsthand and intimate understanding about this topic. The first third of the book introduces this recently created declarative language. Syntax, semantics, namespaces, terminology, and nuisances between C# and Visual Basic are thoroughly explained. The author takes the reader by the hand and walks through simple query constructions for each keyword operator. He utilizes the debugger as an onsite teaching assistant to explore the intricacies of LINQ behind the scenes. A really nice aspect about this read is there are absolutely no constraints to LINQ. The author makes every attempt to point out unconventional and conventional opportunities. He draws out the potential, flexibility, and strength found in LINQ. As the evidence shows, LINQ is just incredibly easier to work with data than ADO.NET, and this point surfaces throughout the book. For example, multiple data sources can be combined with little code. How neat is this little nugget for developers? Thinking outside the box is also greatly encouraged. One of many shared suggestions is rigging LINQ to perform searches on application logs. Well, this information can be collected to refine the application to better suit users and organize the help support team to respond faster in troubleshooting situations. Extra value with good offerings like this is extremely beneficial. Furthermore, the author recommends how to deal with security and performance concerns. When additional explanation is required for a topic, the reader is assured that either clarification will occur later in the book or ample external resources are supplied. The author sincerely wants to spread the usefulness of this language to expand your resources and knowledge. He clearly enjoys this material and it shows. 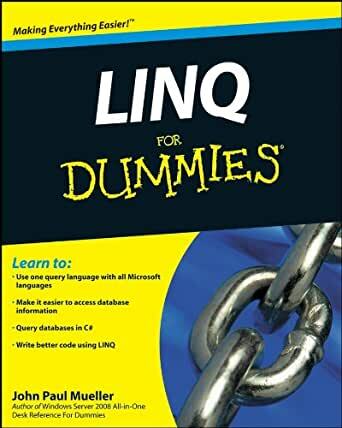 As far as requests go for a future edition of this book, one comment is to combine the chapters dealing with LINQ to SQL or, at the very least, place them next to each other. As the order stands now, the disjointed placement of the chapters disrupts flow. The pages devoted to step by step instructions of sample databases into SQL Server are a bit too thorough. Instead, it would be nice to see those pages dedicated to more interesting topics such as creating a custom provider. With the ADO.NET Entity Data Model gaining momentum, a walkthrough incorporating LINQ would be a great bonus. Technology just grows too fast! Before one realizes it, technology will be off to college soon. As the name of the series indicates, this book is for newcomers to LINQ to gain a grasp on this improvement in data interaction. Although as the completion of this book viewing approaches, no one truly stays a "dummy" for long. Except in my case, as someone who is not self-conscious about his IQ, I am proud to have graduated to an educated dummy status...only to acknowledge that I am a complete dummy at gardening.